Who would have ever thought, a year ago that Mr. Trump would win the Republican nomination, let alone the presidency? Well, what seemed farfetched is now a reality. This is the beauty of our democracy. Anyone can run for office, and anyone can win. Donald Trump, a brash Washington outsider, did just that and was inaugurated yesterday. Here are some of my random thoughts. The election is over. We inaugurated a new President of the United States of America. His name is Donald Trump. Whether you like it or not or agree with it or not, President Donald Trump is our new reality. Deal with it. By law, Donald Trump is a legitimate President. Now, he has to earn a different kind of legitimacy – the respect of the American people through the work that he does every single day. I understand the outrage and fear, but the “Not My President” rhetoric is crazy talk and is a waste of energy. 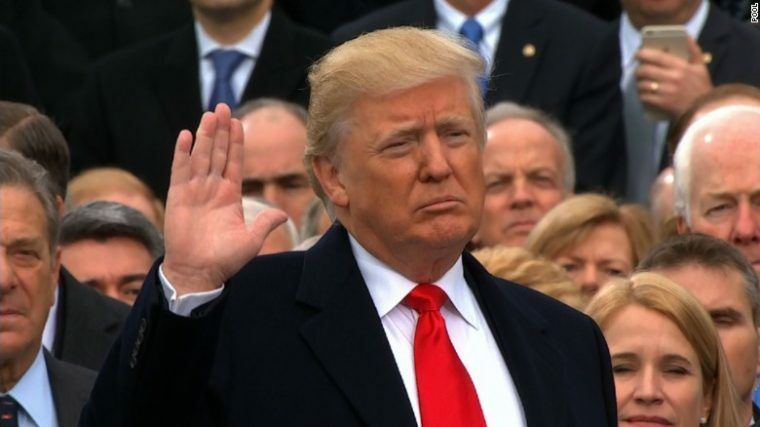 If he is not your president, then who is? You may not want to acknowledge him as your president, but that would make you no different than the same hate-filled fearmongers who would not recognize President Obama as theirs. Here’s the logic: We live in the United States. Donald Trump is the President of the United States. Therefore, Donald Trump is our President. Accept this unexpected reality. To do otherwise is illogical and a waste of time and energy. So, let’s stop complaining about Russia, the CIA and other things we think impacted the election. It’s time to move forward. Our country is flawed, but the state of the union is not as dark as Trump painted it yesterday after he was inaugurated. For the first time in history, an inauguration speech used words like carnage, bleed, depletion, sad, and tombstones. The way he described it, you would think we were living in a dystopian America, led by the worst President in the world. The way he talked, you wouldn’t think the unemployment rate is at 4.7 percent (has steadily dropped since 2012), jobs have increased for the last 75 months, gas prices are under $2.50 and we didn’t have to bow to a Saudi king to get them there (Newt Gingrich said he had a plan to get the gas prices to 2.50), or millions who did not have health, now have healthcare. No, it seems President Trump sees only blight and America as a hellhole. Sad! Yes, I know there are some unpleasant things in our country (like in every country). We still deal with racism, sexism, homophobia, xenophobia, unemployment, crime, and poverty, but the United States of America is still becoming “the perfect union” we all dream about. We have freedoms that many countries don’t enjoy. Our political system is imperfect, but it works – at least, works better than most in the world. We live in a democracy, not a dictatorship. We have checks and balances that help curb and limit the abuse of power. No, we don’t have a perfect country, but we still live in a good country. In all of my years of voting, never has there been a time where an incoming President had just as many protesters as supporters. Some Christian leaders strongly opposed Donald Trump. Other Christian leaders see Donald Trump as God’s divine intervention and an answer to prayer for our nation. Some believe that Donald Trump will make America great again. Others think he will undermine our democracy and set the clock back 300 years. Some believe he will be a president for all people while others believe he will be a president for a select group of individuals. The truth is, I don’t know what he will do. But, I see what I need to do. In the midst of conflict and division, I have the mandate to work for peace and build unity (Romans 12:18). Hatred is not the answer. Vitriolic rhetoric is not the solution. Saying things about a person on Facebook and Twitter that you would never say to the person, face to face, is not the answer. That’s cowardice. Peace and unity come only when people with differences talk with one another, educate one another and grow to love one another. Some unity and peace will come with struggle, but we must continue to discover new and fresh ways to live up to our creed: We hold these truths to be self-evident, that all men are created equal. With any election, we can only hope the future will be bright or think it might be bleak. Millions of Americans believe that Trump will be a sort of savior for our nation. Millions more believe that he will undermine our progress as a nation. The truth is, we don’t know. We simply cannot predict what will happen in the future (Ecclesiastes 8:7; Proverbs 27:1). We are finite and limited creatures. We can only presume. Only God knows the future and has the power to change it. God controls the future because he is the only One who knows the future (Psalm 139:4; Isaiah 42:9). God controls the future because he is the only One who can reveal the future (Daniel 8:19). So, let’s put our hope in the name of the Lord and not symbols of human-made power (Psalm 20:7). Let’s ask God to help us manage our expectations and live with the tension of optimism and human frailty. We know this: God will reign sovereignly over this administration and will direct it according to his purposes (Proverbs 21:1). Donald Trump was elected and inaugurated as President of the United States of America. He deserves an opportunity to serve the American people. Let’s see what he will do to make our country better. We owe him that like we do every President that is elected. I hope he does a good job for all Americans in the next four years. If he does well, then he deserves another four years. But, if he does not do a good job, then we must hold him accountable. If his hubris causes him to make decisions that are only in his best interest and the best interest of a select group of people, then we must hold him accountable. When he lies, we must hold him accountable. Through elected officials, we must challenge policies that are not for all people. We must hold him accountable for rhetoric and tendencies that leave people out and malign them as image-bearers, especially women, Muslims, Black and Latinos, the poor and the marginalized. President Trump has 322 million bosses, and the beauty of our democracy is, if he does not do a good job, we can do something about it. We can make his stay at 1600 Pennsylvania Avenue temporary and fire him and elect a new President in four years. Keep Living as if God is our King. We may have a new president in the Oval office, but God is still King (Psalm 29:11). He was inaugurated from all eternity. He is Lord of heaven and earth (Deuteronomy 4:39). God made the world and everything in it. Therefore, he can claim what is his. He rules over what is his. Whether people realize it or not, kings and presidents are God’s vice-regents. We have human kings and presidents who rule. But, God is in heaven and super rules. Our God is the same, yesterday, today and forever. Because he never changes, we can trust his sovereign hand and purposes. I went to bed and God was King, and I woke up this morning and he was still King. Some trust in horses and chariots, but we will believe in the name of the Lord our God (Psalm 20:7). Pray for our New President. May the Lord bless and keep our new president, cause his face to shine upon our new president, be gracious to our new president, and give our new president peace. This administration will make important decisions in the next four years. The decisions that our government officials make will either bring blessings or hardships. I pray it will be the former and not the latter.